The UN Environment Programme (UNEP) has released a report titled 'Bank and Investor Risk Policies for Soft Commodities' along with an accompanying Soft Commodities Forest-risk Assessment Tool addressing deforestation and forest degradation risk in the agricultural value chain. 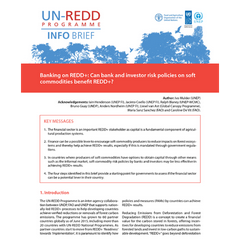 A UN Collaborative Programme on Reducing Emissions from Deforestation and Forest Degradation in Developing Countries (UN-REDD) information brief titled 'Banking on REDD+: Can Bank and Investor Risk Policies on Soft Commodities Benefit REDD+?' was produced in parallel. 29 July 2015: The UN Environment Programme (UNEP) has released a report, titled ‘Bank and Investor Risk Policies for Soft Commodities,’ along with an accompanying Soft Commodities Forest-risk Assessment Tool addressing deforestation and forest degradation risk in the agricultural value chain. A UN Collaborative Programme on Reducing Emissions from Deforestation and Forest Degradation in Developing Countries (UN-REDD) information brief, titled ‘Banking on REDD+: Can Bank and Investor Risk Policies on Soft Commodities Benefit REDD+?’ was produced in parallel. The ‘Bank and Investor Risk Policies for Soft Commodities’ study, commissioned by UN-REDD, was produced by the Natural Capital Declaration (NCD) – a global finance-led and CEO-endorsed initiative co-convened by UNEP’s Finance Initiative and the Global Canopy Programme (GCP) that seeks to accelerate the integration of natural capital considerations into financial products and services. The study highlights policies that banks and investors can adopt to help reduce deforestation and forest degradation risks resulting from unsustainable practices across agricultural supply chains that are major drivers of tropical deforestation. The report consists of five parts: the rationale behind the publication; unpacking deforestation risk; methodology; detailed results; and framework and recommendations. The NDC Soft Commodities Forest-risk Assessment Tool (SCFA) supplies a framework to evaluate policies adopted by banks and investors to address deforestation and forest degradation risk in the agricultural value chain. Together, ‘Bank and Investor Risk Policies for Soft Commodities’ and the risk assessment tool provide: greater clarity on criteria that banks and investors can adopt to strengthen policies and address exposure to deforestation and forest degradation risks from the production of palm oil, soy and beef; and an analytical framework with criteria to assess the scope, strength, and implementation, reporting and monitoring of policies.